The Saudi Thoracic Society (STS) launched the Saudi Initiative for Chronic Airway Diseases (SICAD) to develop a guideline for the diagnosis and management of chronic obstructive pulmonary disease (COPD). This guideline is primarily aimed for internists and general practitioners. Though there is scanty epidemiological data related to COPD, the SICAD panel believes that COPD prevalence is increasing in Saudi Arabia due to increasing prevalence of tobacco smoking among men and women. To overcome the issue of underutilization of spirometry for diagnosing COPD, handheld spirometry is recommended to screen individuals at risk for COPD. 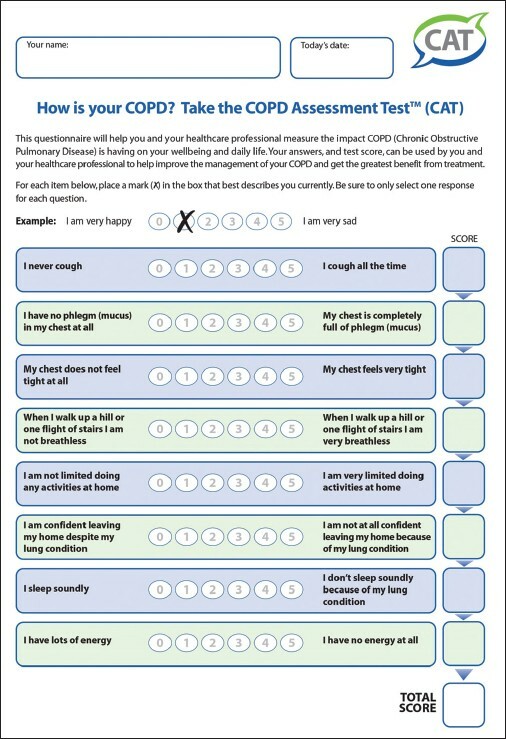 A unique feature about this guideline is the simplified practical approach to classify COPD into three classes based on the symptoms as per COPD Assessment Test (CAT) and the risk of exacerbations and hospitalization. Those patients with low risk of exacerbation (<2 in the past year) can be classified as either Class I when they have less symptoms (CAT < 10) or Class II when they have more symptoms (CAT ≥ 10). High-risk COPD patients, as manifested with ≥2 exacerbation or hospitalization in the past year irrespective of the baseline symptoms, are classified as Class III. Class I and II patients require bronchodilators for symptom relief, while Class III patients are recommended to use medications that reduce the risks of exacerbations. 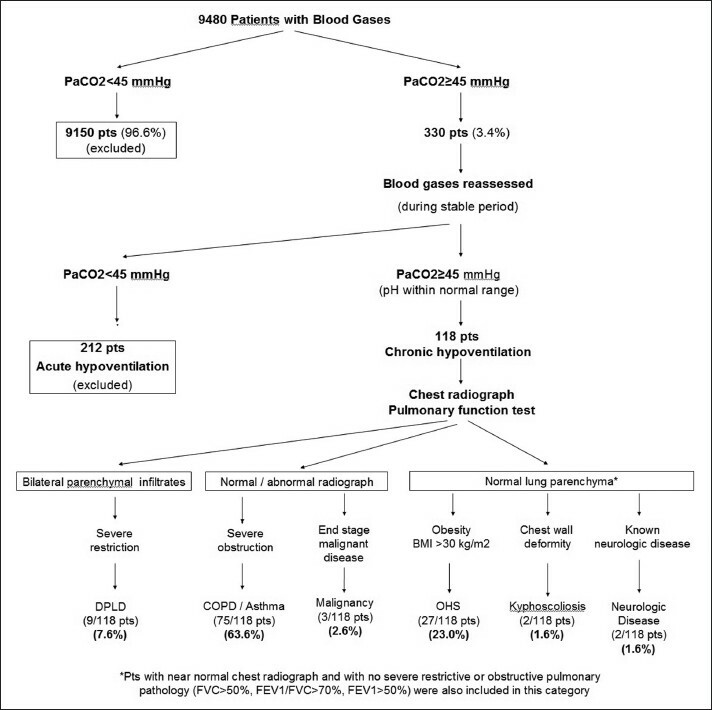 The guideline recommends screening for co-morbidities and suggests a comprehensive management approach including pulmonary rehabilitation for those with a CAT score ≥10. The article also discusses the diagnosis and management of acute exacerbations in COPD. Background: The IL-4 receptor alpha subunit (IL-4Rα), when associated with the common gamma chain receptor, or the IL-13Rα1 subunit, transduces signals to STAT6 in response to IL-4 and IL-13 stimulations. This results in a number of cell-specific responses including Th2 differentiation, lymphocyte proliferation and IgE production. Given the prominent role of IL-4Rα in allergic disorders, several single-nucleotide polymorphisms (SNPs) have been found associated with asthma and other atopic disorders, including rs1805010 (I75V) and rs1801275 (Q576R) SNPs; however, lack of significant association have also been reported for some ethnic groups. The objective of this study was to determine whether IL-4Rα rs1805010 and rs1801275 polymorphisms are associated with asthma in patients from Saudi Arabia. Materials and Methods: One hundred and ninety severe asthmatic patients (11-70 years old) and 194 healthy subjects of equivalent age range were recruited for blood donation. DNA was purified and genotyping for rs1801275 and rs1805010 polymorphisms in the IL-4Rα gene was performed by PCR amplification, followed by cycle sequencing of the purified PCR fragments using BigDye chain terminator and capillary electrophoresis. Results: Pearson's Chi-square tests showed that the minor alleles, G, for both rs1805010 and rs1801275 SNPs, were significantly more frequent in asthmatics than in the healthy group (Yates' P < 0.05); conversely, the major alleles, A, were significantly more frequent in healthy than in asthmatics (P < 0.05). Concerning association analysis, odds for A/G-G/G genotypes were significantly higher to be associated with asthma predisposition (rs1801275: OR = 2.12; 95% CI = 1.39-3.22; P < 0.001*; rs1805010: OR = 1.6; 95% CI = 1.01-2.53; P < 0.05*; dominant model). Analysis of gender-genotype interactions, with genders nested within A/G-G/G, indicated higher odds for females than males of significant association with asthma (rs1801275: OR = 5.19, 95% CI = 2.09-12.94*; rs1805010: OR = 3.73, 95% CI = 2.06-6.74*). 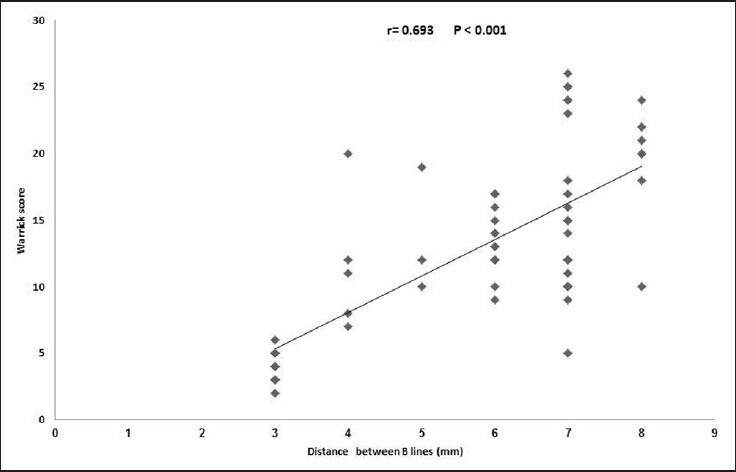 Rs1805010 and rs1801275 were in linkage disequilibrium (D' = 0.27; P < 0.0004*), with G-G haplotype being more frequent in asthmatics than in healthy subjects (OR = 2.43, 95% CI = 1.59-3.71*). Conclusions: The risk alleles, G, of IL-4Rα rs1805010 and rs1801275 SNPs and corresponding A/G-G/G genotypes were significantly associated with asthma predisposition in asthmatics from Saudi Arabia. Objectives: Patients with obesity hypoventilation syndrome (OHS) have significant morbidity and mortality. Early diagnosis and treatment is important and there are limited data on its prevalence and predictive factors. The objective of this observational study was to determine the frequency and predictors of OHS in hospitalized patients at a tertiary health care institution. Materials and Methods: All blood gas analyses of hospitalized adult (age over 18 years) patients were prospectively recruited from the biochemistry laboratory at a tertiary health care center between August 2009 and July 2010. 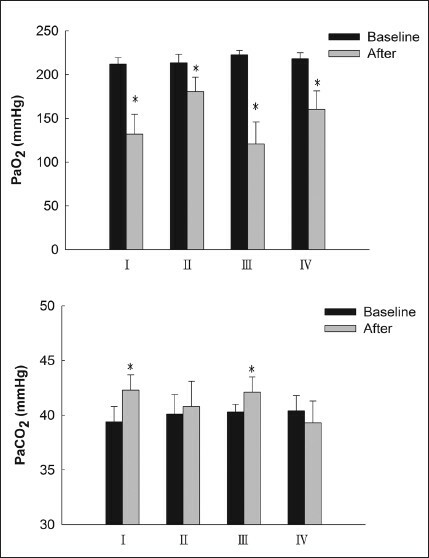 Patients who had hypercapnia (PaCO 2 ≥ 45 mmHg) while breathing room air were included and clinical and laboratory data were obtained from hospital records. A standard questionnaire was also filled by face-to-face interview with patients and/or relatives. Results: A total of 9480 patients' arterial blood gases were evaluated and 330 patients (3.4%) who met the selection criteria were included in the analysis during the study period. Hypoventilation was associated with acute diseases in 64.2% and chronic diseases in 35.8% of the patients. Of the chronic hypoventilation patients, 24.4% had OHS. Univariate logistic regression analysis showed that, female gender, body mass index (BMI), smoking, PaO 2 , SaO 2 and a PaCO 2 /BMI <1.5 were significantly related to OHS. In multivariate logistic regression analysis, BMI >35 kg/m 2 , SaO 2 <91.4% and PaCO 2 /BMI <1.5 were significantly related to OHS. A PaCO 2 /BMI <1.5 was an independent variable strongly predictive of OHS (odds ratio: 36.9, 95% of the confidence interval: 2.75-492.95, P = 0.007). Conclusions: OHS is a common cause of chronic alveolar hypoventilation. A careful examination PaCO 2 /BMI ratio may prevent misdiagnoses among hypercapnic patients. Background: Obstructive sleep apnea (OSA) is an important cause of morbidity in the elderly population. Limited data are available regarding the healthcare utilization and predisposing conditions related to OSA in the elderly. Our aim was to evaluate the healthcare utilization and the conditions associated with new and chronic diagnosis of OSA in a large cohort of elderly patients in the Veterans Health Administration (VHA). Materials and Methods: This retrospective cohort study used inpatient and outpatient VHA data to identify the individuals diagnosed with OSA using ICD-9 codes during the fiscal years 2003-2005. Primary outcomes were emergency department (ED) visits and hospitalizations. Multivariable logistic regression analysis was performed to identify the demographic and clinical characteristics associated with new and chronic diagnosis of OSA. Results: Of 1,867,876 elderly veterans having 2 years of care, 82,178 (4.4%) were diagnosed with OSA. Individuals with OSA were younger and more likely to have chronic diseases than those without OSA. Individuals with chronic OSA were more likely to have diagnoses of congestive heart failure (CHF), pulmonary circulation disorders, COPD, and obesity and less likely to have diagnoses of hypertension, osteoarthritis, and stroke than individuals with newly diagnosed OSA. 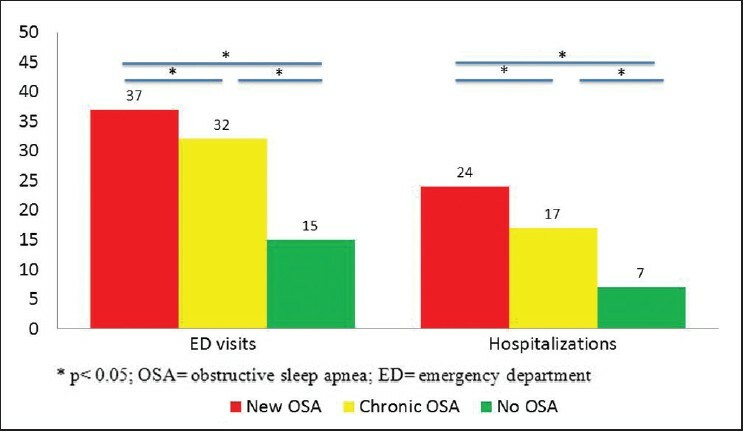 The proportion of patients with new OSA diagnosis who required at least one ED visit was higher than the proportion of chronic OSA and no OSA patients (37%, 32%, and 15%, respectively; P-value <0.05). The proportion of new OSA patients who required at least one hospitalization was also higher than the proportion of chronic OSA and no OSA patients (24%, 17%, and 7%, respectively; P-value <0.05). Conclusion: Patients with OSA had a higher incidence of healthcare utilization compared to patients without OSA. New OSA patients had a higher rate of healthcare utilization in the year of diagnosis compared to chronic patients and patients without OSA. Early OSA recognition may reduce healthcare utilization in these patients. 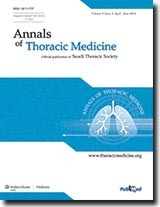 Objective: This prospective study was conducted to evaluate the value of sonographic B-lines (previously called ''comet tail artifacts''), which are long, vertical, well-defined, hyperechoic, dynamic lines originating from the pleural line in assessment of interstitial lung diseases (ILD) and compare them with the findings of chest high-resolution computed tomography (HRCT) and pulmonary function tests (PFTs). Materials and Methods: Sixty-one patients with ILD underwent transthoracic lung ultrasound for assessment of the presence of B-lines and the distance between them. These findings were compared with that of chest HRCT (ground glass, reticular, nodular or honey combing) and PFT as forced vital capacity (FVC), total lung capacity (TLC), diffusion capacity for carbon monoxide (DLCO) and partial arterial oxygen pressure (PaO 2 ). Results: All patients had diffuse bilateral B-lines. The distance between each of the two adjacent B lines correlated with the severity of the disease on chest HRCT where B3 (the distance was 3 mm) correlated with ground glass opacity and B7 (the distance was 7 mm) correlated with extensive fibrosis and honey combing. Also, the distance between B-lines inversely correlated with FVC (r = −0.848, P <<i> 0.001), TLC (r = −0.664, P < 0.001), DLCO (r = −0.817, P < 0.001) and PaO 2 (r = −0.902, P < 0.001). Conclusion: B-lines that are lung Ultrasound signs seem to be useful in the assessment of ILD. Background: There is a wide geographic and temporal variability of bacterial resistance among microbial causes of ventilator-associated pneumonia (VAP). The contribution of multi-drug resistant (MDR) pathogens to the VAP etiology in Saudi Arabia was never studied. We sought to examine the extent of multiple-drug resistance among common microbial causes of VAP. Materials and Methods: We conducted a retrospective susceptibility study in the adult intensive care unit (ICU) of King Abdulaziz Medical City, Riyadh, Saudi Arabia. Susceptibility results of isolates from patients diagnosed with VAP between October 2004 and June 2009 were examined. The US National Healthcare Safety Network definition of MDR was adopted. Results: A total of 248 isolates including 9 different pathogens were included. Acinetobacter spp. was highly (60-89%) resistant to all tested antimicrobials, including carbapenems (three- and four-class MDR prevalence were 86% and 69%, respectively). Pseudomonas aeruginosa was moderately (13-31%) resistant to all tested antimicrobials, including antipseudomonal penicillins (three- and four-class MDR prevalence were 13% and 10%, respectively). With an exception of ampicillin (fully resistant), Klebsiella spp. had low (0-13%) resistance to other tested antimicrobials with no detected MDR. Staphylococcus aureus was fully susceptible to vancomycin with 42% resistance to oxacillin. 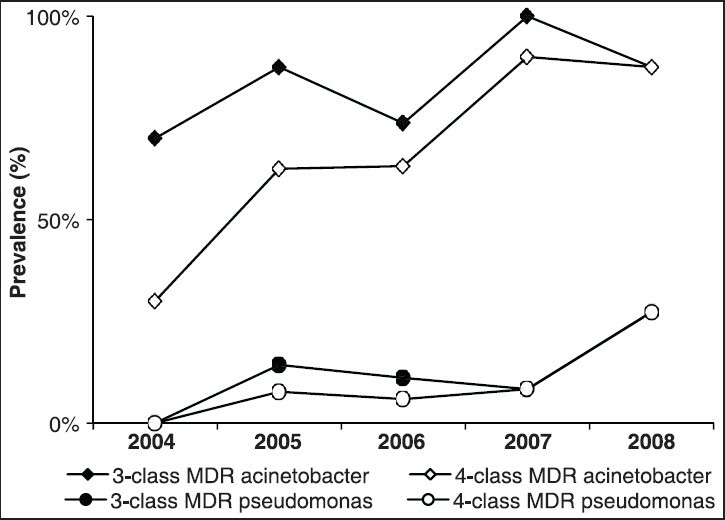 There were significant increasing trends of MDR Acinetobacter spp. however not P. aeruginosa during the study. Resistant pathogens were associated with worse profile of ICU patients but not patients' outcomes. Conclusion: Acinetobacter in the current study was an increasingly resistant VAP-associated pathogen more than seen in many parts of the world. The current finding may impact local choice of initial empiric antibiotics. Context: Thoracotomy is a common procedure. However, thoracotomy leads to lung atelectasis and deteriorates pulmonary gas exchange in operated side. Therefore, different positions with operated side lowermost or uppermost may lead to different gas exchange after thoracotomy. Besides, PEEP (positive end-expiratory pressure) influence lung atelectasis and should influence gas exchange. Aims: The purpose of this study was to determine the physiological changes in different positions after thoracotomy. In addition, we also studied the influence of PEEP to positional effects after thoracotomy. Materials and Methods: There were eight pigs in each group. Group I received left thoracotomy with zero end-expiratory pressure (ZEEP), and group II with PEEP; group III received right thoracotomy with ZEEP and group IV with PEEP. We changed positions to supine, LLD (left lateral decubitus) and RLD (right lateral decubitus) in random order after thoracotomy. Results: PaO 2 was decreased after thoracotomy and higher in RLD after left thoracotomy and in LLD after right thoracotomy. PaO 2 in groups II and IV was higher than in groups I and III if with the same position. In group I and III, PaCO 2 was increased after thoracotomy and was higher in LLD after left thoracotomy and in RLD after right thoracotomy. In groups II and IV, there were no PaCO 2 changes in different positions after thoracotomy. Lung compliance (C rs ) was decreased after thoracotomy in groups I and III and highest in RLD after left thoracotomy and in LLD after right thoracotomy. In groups II and IV, there were no changes in C rs regardless of the different positions. Conclusion: There were significant changes with regards to pulmonary gas exchange, hemodynamics and C rs after thoracotomy. The best position was non-operated lung lowermost Applying PEEP attenuates the positional effects. In keeping with international trends, lung cancer incidence and mortality are increasing among the Irish population with many patients presenting with advanced disease that excludes the potential for curative management. Consequently palliative treatment options for this patient group are being increasingly explored with various degrees of success. Endobronchial stenosis represents a particularly challenging area of management among these patients and a number of techniques have been described without the identification of a single gold standard. We report our experience of the first time use of endobronchial cryotherapy in Ireland with reference to a case series, including an example of its use in the management of benign disease, in order to support patients with borderline lung function and enable definitive palliative treatment. Lymphangioleiomyomatosis (LAM) is a rare disease that leads to airways and lymphatic channels obstruction due to abnormal smooth muscle proliferation. It presents with dyspnea, pneumothorax or chylothorax. Lung transplantation (LT) has emerged as a valuable therapeutic option with limited reports. 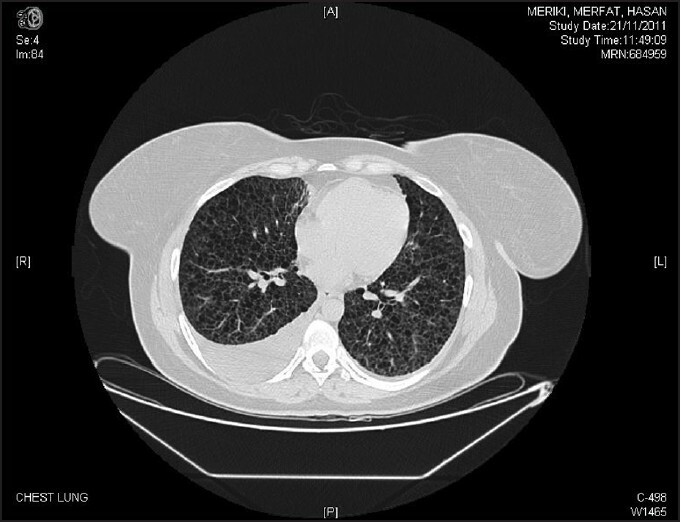 We report a case of LAM that underwent double LT and complicated by refractory bilateral chylothorax which was managed successfully by povidone-iodine pleurodesis and the addition of sirolimus to the post-transplantation immunosuppressive therapy. The patient has no recurrence with 24 months follow-up.